NoTricksZone Review: The book 'exposes the hypocrisy of jet-setting, yachting & limousine' driving Hollywood liberals. "The book has rocketed to the No. 1 seller position in a variety of categories. That’s no surprise considering I read the first 188 pages in the first sitting alone before putting it down for the first time." "Morano's renowned, upbeat attack-style comes through in full color. 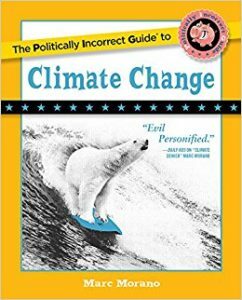 Not only is the book humorous, but it’s also chock-full with data, facts and recent hard scientific findings that will make the Al Gore-acolytes cringe in embarrassment." "Green hypocrisy exposed: Morano’s book exposes the hypocrisy of jet-setting, yachting limousine billionaire leftist elitists, who lead pampered lives in energy-guzzling mansions and private jets while preaching to the rest of us trying to make ends meet about the need to forego fossil fuels." "Morano writes climate sanity was restored to the United States with Trump’s election, and that Trump is: “The warmists’ worst nightmare." 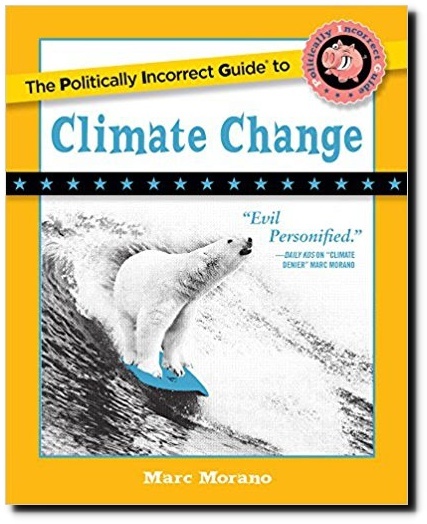 It is authored by the person who leading German center-left “intellectual” weekly Die Zeit once portrayed (black vs white) as the Godfather of the global warming denial and doubt syndicate: Marc Morano of CFACT’s Climate Depot.